When the cold wind blows and the humidity dips outside and inside, you might start suffering from symptoms that seem like a cold or the flu, but the symptoms seem to only fade when the weather starts to warm up again. What you’re dealing with are symptoms of low humidity. So, it might be time for you to invest in a humidifier. There are several types of humidifiers from which you can choose but finding the best humidifier for your furnace might be your best bet. 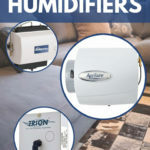 It isn’t for everyone, but if a whole-house humidifier that connects to your water line and your central heating unit sounds like it makes sense for your home, then you’re going to want to keep reading. What’s the Difference Between a Furnace Humidifier and All the Others?